2019 Virtual ticket log in. Is traveling to San Diego for Social Media Marketing World 2019 just not an option for you? What if you could catch ALL the conference sessions at your convenience without any travel expenses or the need to replicate yourself? The good news is now you can! We’re happy to announce the Virtual Ticket to Social Media Marketing World 2019! For a fraction of the cost of a regular ticket, you’ll get full access to recordings of EVERY session. Yes, every keynote, the hands-on workshops, and each great session–the ones people travel thousands of miles to see–will be at your fingertips. With your Virtual Ticket, you’ll have access to 120+ online recordings of everything. You can watch playbacks from your computer, tablet, or smartphone at your leisure. “My eyes are sore as I have watched way too many sessions today! All awesome stuff. It’s like Netflix… ‘just one more,'” said virtual ticket attendee Julia Doherty. You’ll also be able to interact with your peers via our private networking group. Note: All-Access conference ticket holders get this at no added cost! Why Consider a Virtual Ticket? Studies show people who further their professional development are more successful, reach their business goals faster, enjoy their work more, build better relationships, and earn a higher income! When you register for a Virtual Ticket to Social Media Marketing World, a unique ID and password will grant you access to all the session recordings. You simply log in, select the session you’d like to watch, and click play. You’ll see the same sessions that live attendees experienced. You can also download a PDF of each slide deck for further study. Session recordings will begin posting within 10 days after the conference. You will have playback access for 18 months from date of ticket purchase. We’ll also provide downloadable audio MP3 files you can take with you. This means you can learn while you drive, work out, or are on the go. You’ll gain access to our private and exclusive networking groups as soon as you register. There you can connect with peers, help others, and ask questions. Your Virtual Ticket includes access to private Facebook groups for discussion and networking. 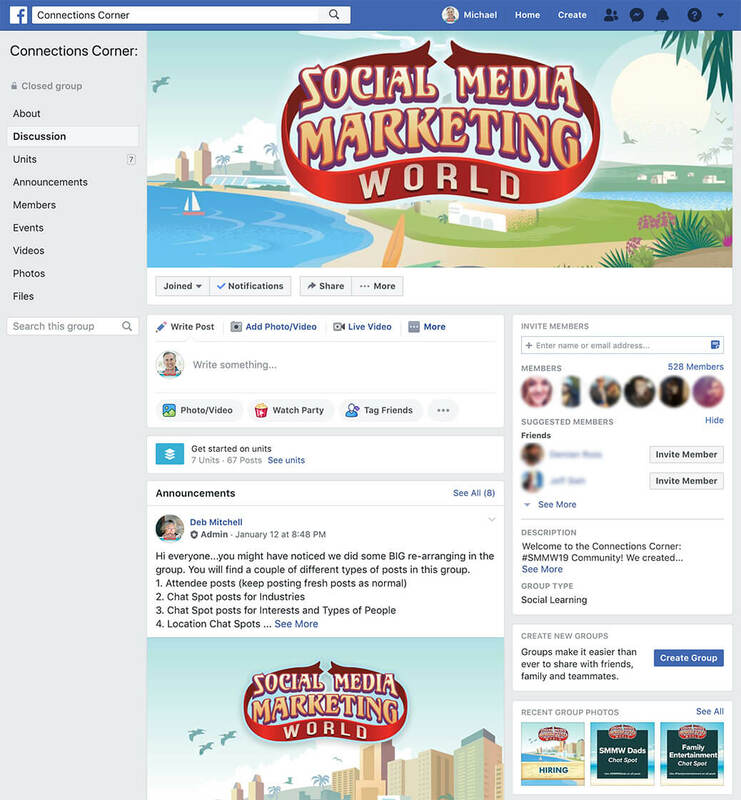 Join any of our 19 Facebook groups to connect with other marketers who share your industry, area of interest, or even region of the world. They’re only for Social Media Marketing World attendees & Virtual Ticket holders. The Virtual Ticket was designed by marketers for marketers. That means we built it to accommodate your busy schedule. You can pick and choose what to watch, whenever you want to. You have an entire year to soak in all the sessions. WHO: This Virtual Ticket is ideal for any marketer, business owner, or influencer who wants to better understand the latest social media tactics or discover tips and know-how to grow their business. WHAT: The Social Media Marketing World Virtual Ticket provides full online access to ALL sessions from the physical conference in San Diego. These are videos you can play over and over. You’ll also get PDFs of slides and audio MP3 files. In addition, a private and exclusive networking group allows participants to network and ask questions. Click here to see the sessions you’ll gain access to. WHERE: At your home, office, or on the road! You watch sessions using your computer, tablet, or smartphone. WHEN: Session recordings will start to be posted within 10 days after the conclusion of Social Media Marketing World 2019. You’ll have access to all the sessions for 18 months from date of ticket purchase. WHY: You’ll be able to implement effective social media strategies and tactics that will help improve your marketing, grow your following, and build your business. This pass will ensure your business is maximizing the full potential of social media! HOW: When you purchase your Virtual Ticket, we’ll email you instructions for your exclusive access to the content. If you were to attend the live Social Media Marketing World 2019 in San Diego featuring a lineup of world-class experts the cost would be $1597. And that doesn’t include the added costs of travel and lost work time! Not with the Virtual Ticket!! With a Virtual Ticket to Social Media Marketing World you have no costs for travel, meals, hotels, cars, or lost time! Why? Because it’s an online virtual ticket. Get Your Virtual Ticket Now!! Sample-It Guarantee: You can try the first two days once the recordings are posted and still cancel for a full refund if you determine this is not for you. Scroll down for more about this guarantee. If you learn just one strategy or tactic that will increase your social media marketing success, the investment in your professional development will have paid for itself many times over. Are the sessions streamed live? To keep the costs exceptionally low, we’ll be recording the sessions, editing them, and begin posting them within 10 days following the live event. At your home or office. Because this is a virtual ticket, there is no physical venue and no travel expenses. Most of the sessions are 45 minutes in duration. We have set up a private networking group. This is a place where you can post questions and get answers (and this can happen the moment you sign up!). Can I purchase just a single session? You can watch any or all of the sessions. However, a virtual ticket is like a Disneyland ticket: you get access to everything. You can email world@socialmediaexaminer.com and we will get back to you right away. 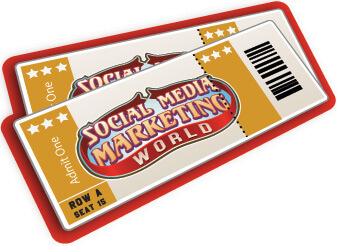 What if I already purchased a physical ticket to Social Media Marketing World 2019? Do I get a free virtual ticket? Maybe. If you registered for an All-Access Ticket to Social Media Marketing World, you will receive special access instructions after the event. However, the Community Ticket and Marketer Ticket don’t include a Virtual Ticket. This virtual ticket offers the best social media marketing advice from the biggest names in the industry. Experience the first two days after we post the recordings and see if it feels right for you. Just give it a try. If you believe it’s not right for you and you don’t want to experience any more sessions or use the materials, just drop us a line at orders@socialmediaexaminer.com within 48 hours (no later than April 12, 2019), and we’ll gladly refund your money and cancel your access. No hassles. No hard feelings. Our goal is to serve you to the best of our abilities and help you gain measurable results. In fact, just a few weeks after you’ve watched the sessions, you’ll be amazed when you look back at where you started and where you’re headed.